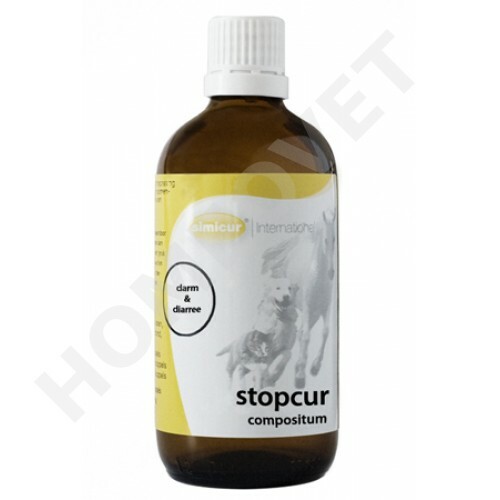 Stopcur is a homeopathic tincture in a 100 ml dropper bottle of SIMICUR for oral use in dogs, cats, horses and ponies. Application: Administered to the feed Stopcur ensures for optimal metabolism, resulting in a healthy condition of the intestinal mucosa . Stopcur has a regulating effect on intestinal peristalsis and on the intestinal mucosa. In combination with the astringent effect Stopcur is indicated for the treatment of diarrhoea and intestinal cramps, especially in nervous animals. Stopcur is also applicable to stool as a result of poor digestive problems. Effect: Diarrhoea is a symptom in which the irritated intestines attempt to remove toxic wastes. Diarrhoea is associated with increased bowel activity and increased water excretion. Due to the astringent effect of Quercus increased water excretion is stopped. The intestinal activity is regulated by Nux Vomica. In combination with the mucosal healing effect of Plantago, casings are put to rest and thus stopped the diarrhoea. Note: Stopcur is especially suitable for nervous animals, with the nervousness also manifested by diarrhea or thinner feces. Not two weeks ago after the start of treatment with Stopcur the animal is quiet.